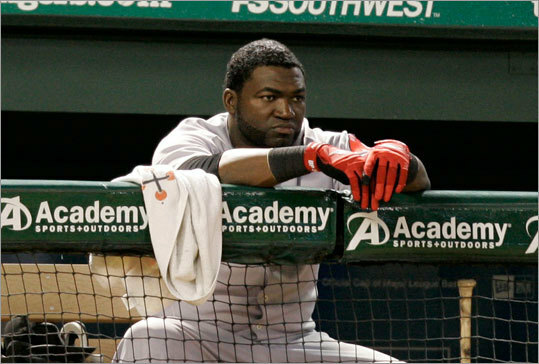 (AP) David Ortiz watches the action during the eighth inning during Tuesday's game. ARLINGTON, Texas - In a clubhouse as silent as the Red Sox’ bats, there was little to offer. Few comments. Few solutions. After manager Terry Francona spoke for just 2 minutes 13 seconds, the players seemed reluctant to talk. Not because they wanted to avoid reporters, necessarily, but mostly because they had no answers. “I ain’t got a lot to talk about tonight, guys,’’ J.D. Drew said. He walked away. David Ortiz had slightly more. “I ain’t got [anything] to say,’’ Ortiz said. “What am I going to say?’’ And though he relented, his comments backed up his first statement. He didn’t have much to say, at least not much that would help the Sox figure out their difficulties. Through five post-All-Star break games, the Sox have scored 12 runs, including a pair in last night’s 4-2 loss to the Rangers. That won’t win games, nor does it engender positive vibes from a rotation that is forced into Herculean feats just to produce victories. Like Josh Beckett last night, whose four runs allowed in eight innings was far too much for the barren Sox offense. The Sox could not overcome a two-run deficit in the first inning, something that would have been laughable earlier in the season, and finished the night in second place in the American League East. Handcuffed by another youngster, this time Tommy Hunter, the Sox lost their season-high fourth straight. So as the averages continue to dip - only Dustin Pedroia (.301) and Kevin Youkilis (.303) remain above .300 - so too does their record, coinciding with a surge by the Yankees, leaving the Sox out of first place for the first time since June 8. And though Beckett said, “This one definitely falls on me,’’ calling it “demoralizing’’ to have given up those runs in the first, it was difficult to absolve the offense. “Tonight, I thought we had some at-bats where we were trying to do too much,’’ hitting coach Dave Magadan said. “When you hit as many fly balls as we hit in this game - some of those fly balls were driven, I thought J.D. had a couple really good at-bats, and hit the ball hard his first three at-bats - but for the most part I think when your team is trying to do too much at the plate, you end up hitting a lot of lazy fly balls and get a little impatient. Magadan pointed out that Hunter had thrown just 59 pitches through five innings. The team simply isn’t having good at-bats with runners in scoring position. The game had even principal owner John Henry agitated, with a simple Tweet of “Frustrating games’’ to mark the difficulty of watching the Sox recently. And it begs the question of whether this is a standard slump, the inevitable downturn in a season, or whether something must be done before the July 31 trading deadline to correct the problem. It was hardly fair to Beckett (11-4). Because even as the Sox did little on the bases, the Rangers did even less as the night got deeper. After allowing a double to Ian Kinsler to open the game, then a two-out walk to Andruw Jones, Beckett let up for just a second. Hank Blalock singled to right field, bringing home Kinsler and Jones, who had just pulled off a double steal. Texas would not have another base runner for 14 batters. It was not until the sixth inning, when Michael Young singled to center, that the Rangers reached first base. And Young was erased on a double play ball by Josh Hamilton to end the inning. The Sox came up with single runs in the sixth and ninth, but it was not enough. Not enough to push the Sox to a needed win. Not enough to bolster Beckett.